Antioxidantien (auch als Antioxidans oder Antioxidanten bezeichnet) neutralisieren frei Radikale und sind der klassische Radikalfänger gegen oxidativen Stress. c) Arteriosklerose, Immunschwächen, Rheuma, Morbus Alzheimer und Krebs begünstigen können. Die vermehrte Bildung von freien Radikalen erfolgt durch Stress, Ozon, UV-Strahlung, einseitige Ernährung, Alkohol- und Tabakkonsum. Einen effektiven Schutz gegen freie Radikale bieten vor allem Lycopin, Xanthone, Provitamin A, Vitamin C und E, die mit diesen aggressiven Verbindungen reagieren und sie somit für die Zellen unschädlich machen. Contribution of free radicals to Pseudomonas aeruginosa induced acute pyelonephritis. Mittal R, Sharma S, Chhibber S, Harjai K.
Division of Infectious Diseases, MS#51, Childrens Hospital Los Angeles, 4650 Sunset Boulevard, Los Angeles, CA 90027, USA; Department of Microbiology, Punjab University, Chandigarh, India. Pyelonephritis induces an inflammatory process in the renal parenchyma, which may occur as a result of excessive reactive nitrogen intermediates (RNI) and reactive oxygen species (ROS) and/or impaired antioxidant capacity. In the present investigation, contribution of free radicals to the development of acute pyelonephritis induced by planktonic and biofilm cells of Pseudomonas aeruginosa was studied. Increase in production of RNI and ROS in urine, bladder and renal tissue following infection with P. aeruginosa was observed which correlated with bacterial load, neutrophil recruitment and malondialdehyde (MDA). Evaluation of the data revealed that excessive production of free radicals causes tissue damage leading to bacterial persistence in host's tissues. Treatment of mice with N-acetylcysteine (NAC), a potent antioxidant, lead to significant amelioration of oxidative stress and subsequent decrease in bacterial titer, neutrophil influx, MDA as well as tissue pathology highlighting important role of free radicals in P. aeruginosa induced pyelonephritis. Results of the present study bring out that production of RNI and ROS contributes to the pathophysiology of pyelonephritis. These findings may be relevant for clearer understanding of host-parasite interactions and may be of clinical importance in the development of preventive intervention against P. aeruginosa induced pyelonephritis. Molecular detection of exercise-induced free radicals following ascorbate prophylaxis in type 1 diabetes mellitus: a randomised controlled trial. Davison GW, Ashton T, George L, Young IS, McEneny J, Davies B, Jackson SK, Peters JR, Bailey DM. Exercise Sciences Research Institute, University of Ulster at Jordanstown, Shore Road, Newtownabbey, County Antrim, BT37 OQB, UK, gw.davison@ulster.ac.uk. AIMS/HYPOTHESIS: Patients with type 1 diabetes mellitus are more susceptible than healthy individuals to exercise-induced oxidative stress and vascular endothelial dysfunction, which has important implications for the progression of disease. Thus, in the present study, we designed a randomised double-blind, placebo-controlled trial to test the original hypothesis that oral prophylaxis with vitamin C attenuates rest and exercise-induced free radical-mediated lipid peroxidation in type 1 diabetes mellitus. METHODS: All data were collected from hospitalised diabetic patients. The electron paramagnetic resonance spectroscopic detection of spin-trapped alpha-phenyl-tert-butylnitrone (PBN) adducts was combined with the use of supporting markers of lipid peroxidation and non-enzymatic antioxidants to assess exercise-induced oxidative stress in male patients with type 1 diabetes (HbA(1c) 7.9 +/- 1%, n = 12) and healthy controls (HbA(1c) 4.6 +/- 0.5%, n = 14). Following participant randomisation using numbers in a sealed envelope, venous blood samples were obtained at rest, after a maximal exercise challenge and before and 2 h after oral ingestion of 1 g ascorbate or placebo. Participants and lead investigators were blinded to the administration of either placebo or ascorbate treatments. Primary outcome was the difference in changes in free radicals following ascorbate ingestion. RESULTS: Six diabetic patients and seven healthy control participants were randomised to each of the placebo and ascorbate groups. Diabetic patients (n = 12) exhibited an elevated concentration of PBN adducts (p < 0.05 vs healthy, n = 14), which were confirmed as secondary, lipid-derived oxygen-centred alkoxyl (RO.) radicals (a(nitrogen) = 1.37 mT and abeta(hydrogen) = 0.18 mT). Lipid hydroperoxides were also selectively elevated and associated with a depression of retinol and lycopene (p < 0.05 vs healthy). Vitamin C supplementation increased plasma vitamin C concentration to a similar degree in both groups (p < 0.05 vs pre-supplementation) and attenuated the exercise-induced oxidative stress response (p < 0.05 vs healthy). There were no selective treatment differences between groups in the primary outcome variable. CONCLUSIONS/INTERPRETATION: These findings are the first to suggest that oral vitamin C supplementation provides an effective prophylaxis against exercise-induced free radical-mediated lipid peroxidation in human diabetic blood. Clinical trials registration number: ISRCTN96164937 Funding: No external funding. 3: Indian J Exp Biol. 2008 May;46(5):273-309. Free radicals and low-level photon emission in human pathogenesis: state of the art. Van Wijk R, Van Wijk EP, Wiegant FA, Ives J. Convincing evidence supports a role for oxidative stress in the pathogenesis of many chronic diseases. The model includes the formation of radical oxygen species (ROS) and the misassembly and aggregation of proteins when three tiers of cellular defence are insufficient: (a) direct antioxidative systems, (b) molecular damage repairing systems, and (c) compensatory chaperone synthesis. The aim of the present overview is to introduce (a) the basics of free radical and antioxidant metabolism, (b) the role of the protein quality control system in protecting cells from free radical damage and its relation to chronic diseases, (c) the basics of the ultraweak luminescence as marker of the oxidant status of biological systems, and (d) the research in human photon emission as a non-invasive marker of oxidant status in relation to chronic diseases. In considering the role of free radicals in disease, both their generation and their control by the antioxidant system are part of the story. Excessive free radical production leads to the production of heat shock proteins and chaperone proteins as a second line of protection against damage. Chaperones at the molecular level facilitate stress regulation vis-à-vis protein quali y control mechanisms. The manifestation of misfolded proteins and aggregates is a hallmark of a range of neurodegenerative disorders including Alzheimer's disease, Parkinson's disease, amylotrophic lateral sclerosis, polyglutamine (polyQ) diseases, diabetes and many others. Each of these disorders exhibits aging-dependent onset and a progressive, usually fatal clinical course. The second part reviews the current status of human photon emission techniques and protocols for recording the human oxidative status. Sensitive photomultiplier tubes may provide a tool for non-invasive and continuous monitoring of oxidative metabolism. In that respect, recording ultraweak luminescence has been favored compared to other indirect assays. Several biological models have been used to illustrate the technique in cell cultures and organs in vivo. This initiated practical applications addressing specific human pathological issues. Systematic studies on human emission have presented information on: (a) procedures for reliable measurements, and spectral analysis, (b) anatomic intensity of emission and left-right symmetries, (c) biological rhythms in emission, (d) physical and psychological influences on emission, (e) novel physical characteristics of emission, and (f) the identification of ultraweak photon emission with the staging of ROS-related damage and disease. It is concluded that both patterns and physical properties of ultraweak photon emission hold considerable promise as measure for the oxidative status. Marked difference in cytochrome c oxidation mediated by HO(.) and/or O(2)(.-) free radicals in vitro. Thariat J, Collin F, Marchetti C, Ahmed-Adrar NS, Vitrac H, Jore D, Gardes-Albert M.
Département de Radiothérapie, Centre Antoine Lacassagne, 33 avenue Valombrose, 06189 Nice Cedex 2, France. Cytochrome c (cyt c) is an electron carrier involved in the mitochondrial respiratory chain and a critical protein in apoptosis. The oxidation of cytochrome c can therefore be relevant biologically. We studied whether cytochrome c underwent the attack of reactive oxygen species (ROS) during ionizing irradiation-induced oxidative stress. ROS were generated via water radiolysis under ionizing radiation (IR) in vitro. Characterization of oxidation was performed by mass spectrometry, after tryptic digestion, and UV-visible spectrophotometry. When both hydroxyl and superoxide free radicals were generated during water radiolysis, only five tryptic peptides of cyt c were reproducibly identified as oxidized according to a relation that was dependent of the dose of ionizing radiation. The same behavior was observed when hydroxyl free radicals were specifically generated (N(2)O-saturated solutions). Specific oxidation of cyt c by superoxide free radicals was performed and has shown that only one oxidized peptide (MIFAGIK+16), corresponding to the oxidation of Met80 into methionine sulfoxide, exhibited a radiation dose-dependent formation. In addition, the enzymatic site of cytochrome c was sensitive to the attack of both superoxide and hydroxyl radicals as observed through the reduction of Fe(3+), the degradation of the protoporphyrin IX and the oxidative disruption of the Met80-Fe(3+) bond. Noteworthy, the latter has been involved in the conversion of cyt c to a peroxidase. Finally, Met80 appears as the most sensitive residue towards hydroxyl but also superoxide free radicals mediated oxidation. 5: Arch Ophthalmol. 2008 Jun;126(6):816-21. Corneal endothelial cell damage by free radicals associated with ultrasound oscillation. Murano N, Ishizaki M, Sato S, Fukuda Y, Takahashi H.
Department of Analytic Human Pathology, Nippon Medical School, Tokyo, Japan. OBJECTIVE: To determine whether ultrasound oscillations in the anterior chamber cause corneal endothelial injury by free radicals. METHODS: A phacoemulsification probe was introduced into the anterior chamber of rabbits' eyes through a limbal incision, and ultrasound oscillation was performed without emulsifying the lens. Rabbits were assigned to 4 treatment groups: (1) no treatment (controls); (2) only irrigation with a salt solution; (3) ultrasound only; and (4) ultrasound oscillations with a salt solution of 0.001M ascorbic acid. The corneas were immunohistochemically examined for oxidative stress using 8-hydroxy-2-deoxyguanosine (8-OHdG), apoptosis by terminal deoxynucleotidyl transferase-mediated dUTP-biotin nick-end labeling (TUNEL) staining, and ultrastructural changes by electron microscopy. The lipid peroxide levels in the aqueous humor were also measured. RESULTS: In the ultrasound-only group, 8-OHdG-positive cells and TUNEL-positive cells were detected at 24 hours; necrotic cells were detected at 12 to 24 hours. Also, lipid peroxide levels were significantly increased at later times in the ultrasound group. Such changes were not observed in other groups. CONCLUSION: Free radicals induced by ultrasound oscillation can cause corneal endothelial damages. Clinical Relevance Clinicians should be aware that free radicals associated with ultrasound oscillation can injure the corneal endothelial cells. 6: Front Biosci. 2008 May 1;13:6106-25. Effects of static magnetic fields in biology: role of free radicals. Biological systems can respond to a wide range of static magnetic fields (SMF). Some of these responses seem to be mediated partly through free radical reactions. For example, in magnetic sense and navigation using the geomagnetic field, one of the most promising mechanisms for explaining magnetic compass is "a radical pair mechanism". Biological free radicals are most commonly oxygen or nitrogen based with an unpaired electron, leading to the terms "reactive oxygen species (ROS)" or "reactive nitrogen species (RNS)". When applying SMF to medical treatment, coupling SMF exposure with possible chemotherapy of cancers is a novel fascinating area that SMF could enhance agent-induced ROS production against tumors. In addition, one of the potent mechanisms of SMF effects on hemodynamics and blood pressure has sometimes been linked to nitric oxide pathway. However, health and environmental concerns have been raised because the SMF effects on oxidative stress leading to genetic mutation and apoptosis/necrosis have been found. It seems to take place from free radical generation. 7: Bull Exp Biol Med. 2007 Sep;144(3):390-6. Chemiluminescence as a method for detection and study of free radicals in biological systems. Vladimirov YA, Proskurnina EV, Izmailov DY. Institute of Physicochemical Medicine, Federal Agency for Health Care and Social Development, Moscow. Chemiluminescence observed during LPO or reactions of nitric oxide and oxygen radicals and was named "ultraweak luminescence". In the presence of chemiluminescence activators (luminol, lucigenin, rhodamine G, or coumarine C-525) the appearance of radicals is associated with intensive fluorescence; the registration of this fluorescence is widely used in biomedical and clinical studies. 8: Free Radic Res. 2008 Apr;42(4):379-86. In vitro electron paramagnetic resonance characterization of free radicals: relevance to exercise-induced lipid peroxidation and implications of ascorbate prophylaxis. Davison GW, Ashton T, Davies B, Bailey DM. This study tested the hypothesis that exercise-induced oxidative stress is caused by free radical-mediated damage to polyunsaturated fatty acids (PUFA) which can be prevented following ascorbate prophylaxis. Hyperfine coupling constants (HCC) of alpha-phenyl-tert-butylnitrone (PBN)-adducts were measured via room temperature electron paramagnetic resonance (EPR) spectroscopy in the venous blood of 12 subjects at rest and following maximal exercise during a randomized double-blind placebo-controlled trial and compared to those observed following room-air incubation (2 h at 37 degrees C) of L-alpha-phosphatidycholine, linoleic acid, alpha-linolenic acid and arachidonic acid. All adducts exhibited similar HCC [a(N) 13.6 Gauss (G) and a beta(H) 1.8 G] with the exception of L-alpha-phosphatidycholine [a(N1)=13.4 G, a beta(H1)=1.6 G (37%) and a(N2)=14.9 G, a beta(H2)=0.3 G (63%)] consistent with the trapping of lipid-derived alkoxyl and oleate radicals, respectively. Ascorbate pre-treatment ablated radical formation in both systems. These findings identify circulating PUFA as a potential source of secondary radicals that are capable of initiating oxidative stress in the exercising human. 9: Acta Pol Pharm. 2007 Nov-Dec;64(6):491-5. The research on Antoxid activity in free radicals processes. Department of Toxicology, Medical University, 57/59 Traugutta Str., 50-417 Wrocław, Poland. The joint effect of Antoxid (AX), extract from Radix Scutellariae baicalensis, with vitamin C on ferric reducing human plasma ability (FRAP) was examined. In order to explain the mechanism of Antoxid inhibiting effect on lipid peroxidation stimulated by xylene, its influence on hydroxyl radical generation was examined. The preventing and repairing effect of Antoxid was evaluated towards the lipid peroxidation stimulated with xylene by treatment before or after exposition. The results showed that the various combinations of Antoxid with vitamin C possessed antioxidative properties, but the significant synergistic effect was noted for weight ratio 1:1 of Antoxid and vitamin C in concentration 5 microg/mL. Antoxid didn't decrease the hydroxyl radicals level produced by xylene. Both preventing and repairing effect of Antoxid in oxidative stress caused by xylene is not connected with hydroxyl radical scavenging. 10: J Cereb Blood Flow Metab. 2008 Jun;28(6):1114-26. Epub 2008 Mar 5. Neuroprotective effects of tempol, a catalytic scavenger of peroxynitrite-derived free radicals, in a mouse traumatic brain injury model. Deng-Bryant Y, Singh IN, Carrico KM, Hall ED. Spinal Cord & Brain Injury Research Center and Department of Anatomy & Neurobiology, University of Kentucky Chandler Medical Center, Lexington, Kentucky 40536-0509, USA. We examined the ability of tempol, a catalytic scavenger of peroxynitrite (PN)-derived free radicals, to reduce cortical oxidative damage, mitochondrial dysfunction, calpain-mediated cytoskeletal (alpha-spectrin) degradation, and neurodegeneration, and to improve behavioral recovery after a severe (depth 1.0 mm), unilateral controlled cortical impact traumatic brain injury (CCI-TBI) in male CF-1 mice. Administration of a single 300 mg/kg intraperitoneal dose of tempol 15 mins after TBI produced a complete suppression of PN-mediated oxidative damage (3-nitrotyrosine, 3NT) in injured cortical tissue at 1 h after injury. Identical tempol dosing maintained respiratory function and attenuated 3NT in isolated cortical mitochondria at 12 h after injury, the peak of mitochondrial dysfunction. Multiple dosing with tempol (300 mg/kg intraperitoneally at 15 mins, 3, 6, 9, and 12 h) also suppressed alpha-spectrin degradation by 45% at its 24 h post-injury peak. The same dosing regimen improved 48 h motor function and produced a significant, but limited (17.4%, P<0.05), decrease in hemispheric neurodegeneration at 7 days. These results are consistent with a mechanistic link between PN-mediated oxidative damage to brain mitochondria, calpain-mediated proteolytic damage, and neurodegeneration. However, the modest neuroprotective effect of tempol suggests that multitarget combination strategies may be needed to interfere with posttraumatic secondary injury to a degree worthy of clinical translation. 11: Plant Biol (Stuttg). 2008 Mar;10(2):171-84. Chilling response of plants: importance of galactolipase, free fatty acids and free radicals. The chilling response of plants is complex and based on the interplay of two important metabolic processes--lipolytic degradation of membrane lipids and a set of oxidative reactions leading to lipid peroxidation and membrane damage evoked in chilling-sensitive (CS) plants subjected to low temperature and light. The effects of chilling of detached leaves and intact plants differ and are often neglected during experiments. In closely-related species, the activity of several constitutive enzymes (i.e. superoxide dismutase, ascorbate peroxidase and glutathione reductase) appears to be higher in chilling-tolerant (CT) than in CS species; while in several native, closely-related CS species, lipid acyl hydrolase (galactolipase) activity is higher than in CT species. Moreover, in chilling-insensitive (CI) plants, galactolipase activity is very low and is neither activated by detachment of leaves nor under stress conditions in growing plants. Dark and low-temperature treatments of detached leaves of CS species and post-chilling recovery of growing plants in the light activate galactolipase, which is responsible for the release of free fatty acids (FFA), the main substrates of peroxidation by lipoxygenase and free radicals. In several CS species, increased galactolipase activity is an important factor contributing to chilling susceptibility. Thus, it seems likely that enhancement of chilling tolerance may be achieved by genetically suppressing galactolipase in order to reduce both the degradation of chloroplast lipids and the level of released FFA, and thereby avoiding the deleterious action of their peroxidation products on plant tissues. 12: Rev Med Inst Mex Seguro Soc. 2007 Sep-Oct;45(5):477-84. The evolution and development of currently known organisms, comprised their change and adaptation from the reducing atmosphere to an oxidizing one. The adaptive changes show that some processes were developed to take advantage of the oxidizing atmosphere efficiently. The most important adaptive change was the efficiency in the energy production of aerobic organisms. Some toxic wastes of this process, known as reactive oxygen species, have deleterious functions when modifying and damaging structural and metabolic components of the cells. For this reason, in a parallel way, the processes of evolutionary adaptation included the formation of antioxidant compounds to protect cells from oxidative damage. Nevertheless, under certain circumstances these reactive oxygen species can have paradoxical functions such as the induction of proliferation and cellular death, which occurs in cancer and apoptosis. 13: CNS Neurol Disord Drug Targets. 2008 Feb;7(1):3-10. Alzheimer disease and the role of free radicals in the pathogenesis of the disease. Moreira PI, Santos MS, Oliveira CR, Shenk JC, Nunomura A, Smith MA, Zhu X, Perry G.
Center for Neuroscience and Cell Biology of Coimbra, University of Coimbra, 3004-517 Coimbra, Portugal. Oxidative stress occurs early in the progression of Alzheimer disease, significantly before the development of the pathologic hallmarks, neurofibrillary tangles and senile plaques. All classes of macromolecules (sugar, lipids, proteins, and nucleic acids) are affected by oxidative stress leading, inevitably, to neuronal dysfunction. Extensive data from the literature support the notion that mitochondrial and metal abnormalities are key sources of oxidative stress in Alzheimer disease. Furthermore, it has been suggested that in the initial stages of the development of Alzheimer disease, amyloid-beta deposition and hyperphosphorylated tau function as compensatory responses to ensure that neuronal cells do not succumb to oxidative damage. However, during the progression of the disease, the antioxidant activity of both agents is either overwhelmed or, according to others, evolves into pro-oxidant activity resulting in the exacerbation of reactive species production. 14: Curr Med Chem. 2008;15(5):477-87. Role of free radicals and poly(ADP-ribose)polymerase-1 in the development of spinal cord injury: new potential therapeutic targets. IRCCS Centro Neurolesi Bonino-Pulejo, Messina, Italy. Oxidative stress results from an oxidant/antioxidant imbalance, an excess of oxidants and/or a depletion of antioxidants. A vast amount of circumstantial evidence implicates oxygen-derived free radicals (especially, superoxide and hydroxyl radical) and high energy oxidants (such as peroxynitrite) as mediators of secondary damage associated with spinal cord injury. Reactive oxygen species (ROS) (e.g., superoxide, peroxynitrite, hydroxyl radical and hydrogen peroxide) are all potential reactants capable of initiating DNA single strand breakage, with subsequent activation of the nuclear enzyme poly (ADP ribose) synthetase (PARS), leading to eventual severe energy depletion of the cells, and necrotic-type cell death. Moreover, Poly(ADP-ribosyl)ation is regulated by the synthesizing enzyme poly(ADP-ribose) polymerase-1 (PARP-1) and the degrading enzyme poly(ADP-ribose) glycohydrolase (PARG). Here, we review the roles of ROS, PARP-1 and PARG in spinal cord injury as well as the beneficial effect of the in vivo treatment with novel pharmacological tools (e.g. peroxynitrite decomposition catalysts, selective superoxide dismutase mimetics (SODm), PARP-1 and PARG inhibitors. 15: Vet Clin North Am Small Anim Pract. 2008 Jan;38(1):31-123, v.
Free radicals and antioxidants in inflammatory processes and ischemia-reperfusion injury. This article discusses the current understanding of the role of free radicals and antioxidants in inflammatory processes and in ischemia reperfusion injury. It begins by describing the manifestations of acute inflammation and outlining the cellular events that occur during inflammation. It then describes the biochemical mediators of inflammation with special attention to nitric oxide. It details the process of hypoxia reperfusion injury, the enzymes involved, its treatment, and studies involving specific hypoxia reperfusion injuries in various animal species. 16: Vet Clin North Am Small Anim Pract. 2008 Jan;38(1):ix-xi. Oxidative stress: the role of mitochondria, free radicals, and antioxidants. Preface. 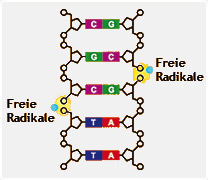 17: Free Radic Biol Med. 2008 Jan 15;44(2):169-79. Epub 2007 Mar 12. Free radicals and muscle fatigue: Of ROS, canaries, and the IOC. Skeletal muscle fibers continually generate reactive oxygen species (ROS) at a slow rate that increases during muscle contraction. This activity-dependent increase in ROS production contributes to fatigue of skeletal muscle during strenuous exercise. Existing data suggest that muscle-derived ROS primarily act on myofibrillar proteins to inhibit calcium sensitivity and depress force. Decrements in calcium sensitivity and force are acutely reversible by dithiothreitol, a thiol-selective reducing agent. These observations suggest that thiol modifications on one or more regulatory proteins are responsible for oxidant-induced losses during fatigue. More intense ROS exposure leads to losses in calcium regulation that mimic pathologic changes and are not reversible. Studies in humans, quadrupeds, and isolated muscle preparations indicate that antioxidant pretreatment can delay muscle fatigue. In humans, this phenomenon is best defined for N-acetylcysteine (NAC), a reduced thiol donor that supports glutathione resynthesis. NAC has been shown to inhibit fatigue in healthy adults during electrical muscle activation, inspiratory resistive loading, handgrip exercise, and intense cycling. These findings identify ROS as endogenous mediators of muscle fatigue and highlight the importance of future research to (a) define the cellular mechanism of ROS action and (b) develop antioxidants as novel therapeutic interventions for treating fatigue. 18: Chem Biol Interact. 2008 Feb 15;171(3):251-71. Epub 2007 Nov 24. The tandem of free radicals and methylglyoxal. Methylglyoxal is an alpha-oxoaldehyde inevitably produced from triose-phosphate intermediates of phosphorylating glycolysis, and also from amino acids and acetone. Recently, the attention has been focused on the involvement of free radicals in methylglyoxal toxicity. In this review, a summary of the relationship between methylglyoxal metabolism and free radical production is presented, extending discussion from the possible metabolic routes to the toxicological events by reviewing the role of free radicals in both generation and degradation of this 1,2-dicarbonyl as well as in the modification of biological macromolecules, and focusing on the action of methylglyoxal upon cellular glutathione content. Methylglyoxal-provoked free radical generation involving reactive oxygen species (ROS), reactive nitrogen species (RNS) as well as organic radicals like methylglyoxal radial or crosslinked protein radical as potential risk factors to tissue damage propagation, is thoroughly discussed. Special attention is paid to the potential therapeutic interventions. The paper arrives at the conclusion that a tight junction exists between methylglyoxal toxicity and free radical (particularly ROS) generation, though the toxicity of 1,2-dicarbonyl evolves even under anaerobic conditions, too. The events follow a sequence beginning with carbonyl stress essential for the toxicity, leading to free radical formation and finally ending in either apoptosis or necrosis. Both oxidative and nitrosative stress play important but not indispensable role in the development of methylglyoxal toxicity. 19: Brain Res. 2008 Jan 29;1191:20-9. Epub 2007 Nov 17. Timing differences of signaling response in neuron cultures activated by glutamate analogue or free radicals. Boutahar N, Reynaud E, Lassabliere F, Borg J.
Faculté de Médecine, Laboratoire de Neurobiochimie, Saint-Etienne Cedex2, France. Oxidative stress and excitotoxicity are both involved in the pathogenesis of neuronal degenerative diseases like ALS. In order to compare their action, some key proteins involved in their respective signaling pathways, particularly ERK and p53, were analyzed in primary cultures of cortical neurons subjected to NMDA or H(2)O(2) treatment. Early ERK activation was detected after NMDA treatment and was maintained during 24 h, but not after H(2)O(2) treatment. Early p53 expression was also found after NMDA treatment but diminished later. On the other hand, it progressively increased from 6 h to 24 h after H(2)O(2) treatment. Blocking ERK1/2 activation with the upstream inhibitor U0126 inhibited NMDA-mediated p53 expression, suggesting that ERK1/2 signals drive the cells to apoptosis under these conditions. In order to identify the initial membrane target of these neurotoxins, PAK1 was analyzed. Early increase of PAK1 expression was measured after NMDA treatment and was still present after 24 h. Conversely increased PAK1 expression was only detected 24 h after H(2)O(2) treatment. In order to define the components through which NMDA or H(2)O(2) induce the final elements of these pathways, p21 and c-jun, we have performed a detailed functional analysis of c-jun and p21 promoters following plasmid transfection. Both p21 and c-jun were activated after NMDA treatment, but this activation was abolished after H(2)O(2) treatment. We conclude that NMDA induces an early effect that involves activation of p53, ERK, PAK1, p21 and c-jun. On the other hand, H(2)O(2) induces long-term p53 expression, late expression of PAK1 without activation of p21 promoter. The timing differences of the action of these neurotoxins may explain why the presence of both compounds is needed to induce neuronal death. 20: Appl Physiol Nutr Metab. 2007 Oct;32(5):942-6. Effects of exercise on brain function: role of free radicals. Radak Z, Kumagai S, Taylor AW, Naito H, Goto S.
Reactive oxygen species (ROS) are continuously generated during aerobic metabolism. Certain levels of ROS, which could be dependent on the type of cell, cell age, history of ROS exposure, etc., could facilitate specific cell functions. Indeed, ROS stimulate a number of stress responses and activate gene expression for a wide range of proteins. It is well known that increased levels of ROS are involved in the aging process and the pathogenesis of a number of neurodegenerative diseases. Because of the enhanced sensitivity of the central nervous system to ROS, it is especially important to maintain the normal redox state in different types of neuro cells. In the last decade it became clear that regular exercise beneficially affects brain function as well, and can play an important preventive and therapeutic role in stroke and in Alzheimer's and Parkinson's diseases. The effects of exercise appear to be very complex and could include neurogenesis via neurotrophic factors, increased capillarization, decreased oxidative damage, and increased proteolytic degradation by proteasome and neprilysin. Data from our and other laboratories indicate that exercise-induced modulation of ROS levels plays a role in the protein content and expression of brain-derived neurotrophic factor, tyrosine recepetor kinase B, and cAMP response element binding protein, resulting in better function and increased neurogenesis. The enhanced activities of proteasome and neprilysin result in decreased accumulation of carbonyls and amyloid beta-proteins, as well as improved memory. It appears that exercise-induced modulation of the redox state is an important means by which exercise benefits brain function, increases the resistance against oxidative stress, and facilitates recovery from oxidative stress.